When it comes to dastardly named pieces of anti-gay legislation, Tennessee’s Don’t Say Gay Bill and Minnesota’s No Homo Promo may be tops in the U.S., but across the Atlantic Ocean Uganda’s Kill The Gays Bill frighteningly reigns supreme. 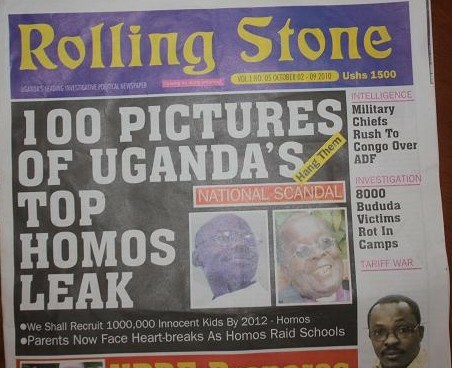 With the high profile murder of LGBT activist David Kato following the Ugandan Rolling Stone newspaper running a series of stories supporting the Kill The Gays Bill including a cover story that said “Hang Them”, international attention seemingly put this piece of terror on the back burner. Uganda’s infamous Kill The Gays bill is back and is being fast-​tracked through Parliament. The Anti-​Homosexuality Bill, or AHB, which prescribes the death penalty for being gay, was far from dead itself, and was never “shelved,” as many in the media werre falsely reporting. Rather, the Uganda Parliament merely ran out of time to debate and vote on it. Now, with a new Parliament in session, the bill, which calls for the death penalty for the “crime” of being gay or HIV-​positive, and prison sentences for friends, family, co-​workers, and acquaintances who believe someone is homosexual but does not immediately report them to authorities, may be voted on “by the end of August,” according to Uganda expert Warren Throckmorton. Uganda, a staunchly conservative and Christian East African country, ranks number 143 of 169 countries in the United Nations Development Programme Human Development Index, which examines a combination of health, education, and living standards. Uganda is also considered to have a high number of people who are illiterate, especially women. All these factors lead to a population easily indoctrinated into religious extremism.